A video has shown the moment founder and general overseer of the Omega Fire Ministries International Apostle Suleman Johnson prophesied about 2019 election postponement. 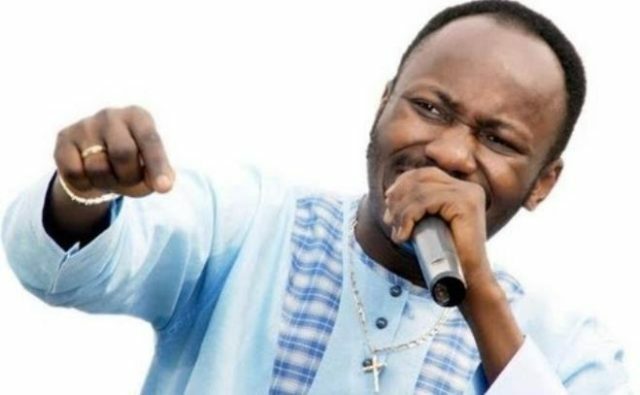 Following the postponement of the Presidential and National Assembly election to next week by the Independent National Electoral Commission, INEC, a clip showing the founder and general overseer of the Omega Fire Ministries International Apostle Suleman Johnson, prophesying the postponement has surfaced online. In a video going viral on social media, the cleric foresaw the postponement of Nigeria’s 2019 elections during the “Open Heaven Crusade” held in Onitsha, Anambra state, on 9th January. Apostle Johnson’s prediction could be said to have come to pass after INEC Chairman, Mahmood Yakubu, announced new dates for the polls on Saturday morning. The pastor said at the crusade, “Can I surprise you? If we do not pray well, I don’t see the election. Many people are debating whether it is a guess work or if it is God speaking through Suleman. The doubt is coming after the man of God had in the past predicted the death of Kaduna state Governor, El-Rufai yet nothing happened to him.